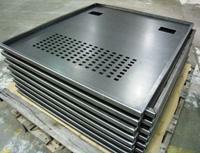 At FedTech, we serve countless industries with our custom manufacturing capabilities. Included in this array of applications, is our ability to manufacture goods in the agricultural industry. We do not sell or produce any final products, we simply help manufacturers in their process to do so. By using custom waterjet cutting and providing laser cutting services, we're able to process materials such as stainless steel, carbon steel, aluminum, plastic, rubber and more. Whether these parts for a tractor, a combine, farm vehicles, irrigation systems, feeders, animal stations, or any other type of product; we can help you manufacture them. At the end of 2008, FedTech was fortunate enough to achieve "Partner Status" with John Deere and Company, a major player in the agricultural industry. This is the highest level of their quality program for their suppliers to achieve. We consistently pride our company in maintaining high quality standards with our parts. FedTech is also ISO 9001:2015 certified. Contact FedTech today to request a quick quote or for additional information on any of our cutting processes. When choosing waterjet or laser cutting, choose FedTech. To see a full list of the industries that we have served at FedTech, view our Industries page or you can even visit our Case Studies page to see some of the projects that we have completed recently.